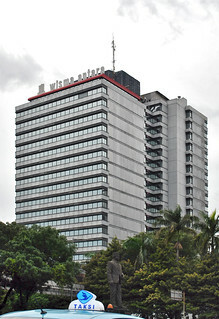 This building is designed by Jan Brouwer Associates NV of Den Haag with Wiratman & Associates, and constructed by Decorient Indonesia (now BAM Decorient) from 1978 to 1980. The building is opened in December 1980, and it has 22 floors and around 70 metres. It is headquarters for state-run news agency ANTARA, alongside many commercial interest. Majalah Konstruksi, dated October 1980 reported the use of glass-fibre reinforced concrete to save use of air conditioner, use of waffle floorplates to eliminate need of floor beams, and influence of Dutch modernism. Gedung ini didesain oleh Jan Brouwer & Associates NV dari Den Haag, Belanda bersama Wiratman & Associates, dan dibangun Decorient Indonesia (sekarang BAM Decorient) dari 1978 hingga 1980. Gedung ini dibuka pada Desember 1980, dan memiliki 22 lantai dan setinggi kurang-lebih 70 meter. Gedung ini merupakan kantor pusat kantor berita milik negara ANTARA, dan beberapa penyewa komersial lain. Majalah Konstruksi edisi Oktober 1980 melaporkan bahwa gedung ini memanfaatkan beton serat kaca (GRC) untuk mengurangi biaya pemakaian AC, lantai dengan model waffle dan pengaruh arsitektur modern Belanda.